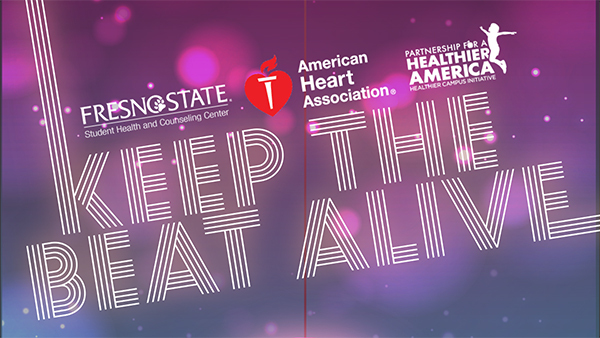 This Valentine's day, keep a healthy heartbeat at the Keep the Beat Alive event. Students, faculty and staff can learn more about life-saving techniques, get their cholesterol checked, be entered into a drawing to attend a concert, and more. This is a collaborative effort between the Student Health and Counseling Center, the American Heart Association and the Partnership for a Healthier America. Learn Hands-Free CPR from the American Heart Association and be entered into a drawing to win TWO free tickets to see Dierks Bentley on Friday, Feb. 15, compliments of President and Mrs. Castro. Fresno State's Mobile Nursing Unit will be there offering FREE cholesterol and diabetes screenings as well as blood pressure checks. FREE fruit and condom roses will also be available.